Industrial transformation and upgrading in the traditional sense is mainly manifested in the changing proportion of industrial output in primary, secondary and tertiary sectors, in the international industrial gradient transfer, in the increase of high-value added products and in the accelerated integration of different industries. 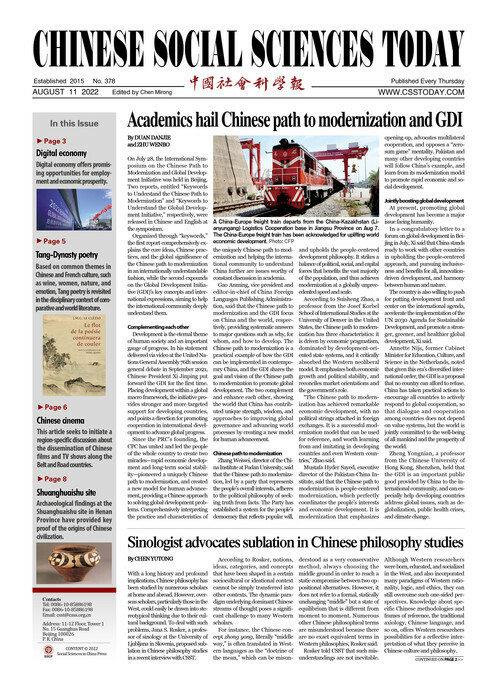 However, during the process, China has encountered a series of problems, such as the coexistence of structural decline and structural prosperity, certain industries trapped at the low-end of the industrial chain, and severe ecological damage, all of which suggest that the traditional industrial transformation and upgrading pattern may be unable to adapt to the high-quality economic development in the new era. Therefore, innovations and breakthroughs are urgently needed in the industrial transformation and upgrading of supply-side structural reform. In a way, building a modernized economic system requires properly handling the changes and continuities of the industrial transformation and upgrade process. Industrial transformation and upgrading is closely related to economic practice. At present, China’s economy is shifting from high-speed to high-quality growth, with new driving forces emerging, new growth points budding, and new formats being invented. Understanding the following changes is of practical significance to establishing a feasible analytical paradigm for industrial transformation and upgrading. First, the high-tech industry has become the leading influence on the proportion of output of the primary, secondary and tertiary industries. Data show that the proportions of output of China’s primary, secondary and tertiary industries have changed from 27.7 percent, 47.7 percent and 24.6 percent in 1978 to 7.9 percent, 40.5 percent and 51.6 percent in 2017, respectively. The secondary industry has held a downward trend after reaching a climax in 2006, while the tertiary industry exceeded 50 percent in 2015. Recent years have shown that high-tech industries play a leading role in the process of high-quality economic development. This can be seen based on new advanced tools, wider technical correlation features, its position in a longer range of the industrial chain and a higher contribution rate to economic growth. Taking Haidian district in Beijing as an example, in 2017, there were more than 2,000 high-tech enterprises above designated size (having an annual revenue of 20 million yuan or more, about three million US dollars) in the region, accounting for less than one sixth of the total number of high-tech enterprises, but their added value accounted for 65 percent of added value in the region, while contributing to 76 percent of the regional economic growth. Second, the international industrial gradient transfer has shifted to the global propagation of new economic industries. Since the 1980s, China has been actively involved in the international production network and has gradually undertaken many labor-intensive, capital-intensive and technology-intensive industries. However, despite China’s continuous expansion in breadth and depth, up to now, developed nations still hold the core high-end technologies, and most of the transfer to China still mostly consists of low-end, outdated or backward production links or industries. In this light, the vigorous development of new economic industries such as the sharing economy, the maker economy, the platform economy and the hub economy demonstrate that China can play a more positive role on the world economic stage. For example, Alibaba, Ant Financial, Didi Chuxing, Ofo, Mobike, China CRRC and other enterprises have expanded their businesses in Thailand, South Korea, Singapore, the United States, the United Kingdom and Australia by means of investment, technology export, mergers, acquisitions and new branches. As these businesses arrive abroad, QR code payment, bike sharing, online shopping and high-speed rail gain wider overseas markets. Third, competition in the production of high-value added products has given way to the global allocation of high-end resources. As of now, the global value chain has reflected the interests of developed countries, ignoring the interests of underdeveloped countries. It has emphasized the constraint mechanism via the vertical division of labor while weakening the incentive mechanism of low-end endogenous growth enterprises. Behind the scenes, the continuous creation of high-added value products necessitates the global allocation of high-end resources, which causes the dynamic enhancement of competitive advantage. Taking talent resources as an example, in 2015 higher education in the United States attracted 90.73 million foreign students, among which the top five source nations were China (32.1 percent), India (12.4 percent), South Korea (7 percent), Saudi Arabia (5.9 percent) and Canada (3.1 percent). In the same year, China’s higher education enrolled 397,600 foreign students, among whom the top five were from South Korea (16.8 percent), the United States (5.5 percent), Thailand (5 percent), India (4.2 percent) and Russia (4.1 percent). The gap is evidently huge. Dialectically, in the process of industrial transformation and upgrading, based on economic growth theory and industrial structure theory, analysis of the technical characteristics and of the evolution of different industries reveals consistent trends. First, the integration of different industries continues to accelerate. Industrial integration is a form of economic division of labor. In most cases, it is caused by the improvement of technological conditions, the relaxation of market control, the reengineering of process management and the evolution of market demand, all of which can inject new vitality into industrial innovation, provide new guarantees for industrial performance and gather a new driving force for industrial development. In fact, new products and business models such as fintech, online education, shared bikes and online shopping are all typical representatives of industrial integration in China. However, these new models still fit the definition of accelerated integration within traditional industrial transformation and upgrading. Different from previous computer technology-driven integration, these internet plus enterprises are closely related to blockchains, cloud computing, big data, artificial intelligence and other cutting-edge technologies. For example, Ant finance, Didi Chuxing, Xiaomi, Toutiao and other enterprises are all based on diversified new technologies. These in-depth integrations of finance and technology, travel and technology, retail and technology, catering and technology, and culture and technology are spawning the present typical dynamic unicorn enterprises. In addition, the differential growth of industrial production efficiency remains unchanged. Long-term differences in production efficiency will lead to the flow of resources among various economic sectors by changing the market price of products. When the resource-allocation effect and the total-factor productivity are positive, high-quality industrial transformation and upgrading can be achieved. To this end, the current phenomena in China, such as fierce competition for talent, are the objective reflection of the accelerated flow of resources among different industries. The root cause lies in how the driving factors of technological innovation, model innovation, management innovation and organizational innovation cause long-term fluctuations in the industrial production efficiency. This too does not go beyond the differential growth of industrial production efficiency described in traditional industrial transformation and upgrading. In contrast with previous extensive expansion, capital flooding and inclusive policy, the current differential growth of the industrial production efficiency pays more attention to high-end talent, matching funds and targeted policies. Taking the hot demand for talent as an example, as AI gains broader prospects, more and more high-end talent is expected to leave posts and launch startups. Finally, the working mechanism of the driving factors in industrial development remains unchanged. The main factors driving industrial development include technological innovation, human capital and financial support, none of which have changed significantly in the transformation and upgrading of industries in the traditional or modern sense. To be specific, the main mechanism of technological innovation is the reliance on diversified input factors such as technology, information and knowledge to trigger major changes in production and service, thus blurring the boundary of traditional industries and giving rise to the development of new business forms and finally promoting industrial transformation and upgrading. In terms of human capital, on the one hand, increasing the overall input to education could indirectly promote the transformation and upgrading of industries. On the other hand, the flow of top talent resources between different industries could directly affect the transformation and upgrading of industries. This has always been the case. The mechanism for financial factors is as follows: more than just turn savings into investment, it directly promotes industrial transformation and upgrading by influencing and adjusting the industrial stock and incremental structure, or indirectly guides the transformation and upgrading by stimulating technological innovation and optimizing resource allocation. In the meantime, the development and expansion of the modern financial industry itself also constitutes an important part of industrial transformation and upgrading. In summary, the following aspects should be emphasized in future industrial transformation and upgrading. First, scientific identification of new high-tech industries is key. Based on the resource endowment of different regions, we should consider high-tech industries as the main drivers of modern industrial transformation and upgrading. Second, we should improve the whole industrial chain at the national level. That said, efforts must be made to design a fitting scientific spatial industrial layout to avoid falling into the trap of vicious “self-consuming” competition. Third, we should make use of our advantages in technology, scale and experience to promote the global propagation of new economic industries and seize overseas market shares. We also need to actively carry out the “going global” strategy and allocate high-end resources worldwide to develop dynamic competitive advantages. Lastly, it is necessary to strengthen the intensity of R&D investment, education funds, and innovation in the guiding role the government plays through financing. At the same time, we should improve the mechanism for inclusive and prudent regulation and strengthen the supervision of new problems arising in the course of industrial integration. Wang Haibing is from the Institute of Industrial Economics at the Chinese Academy of Social Sciences.